On Sunday P. Brad Dewar spoke on perspective. Particularly on thinking BIG! This is such a great reminder for us who live in a world filled with voices and fears that would have us think in limited or small ways. The gravity on this planet is to think and be average, but God's got so much more for us! It takes energy break the pull of this gravity, to stand up tall and to keep our perspective in line with God's will for our lives, doesn't it? We don't just drift there, no, we have to "work out" this great salvation that God has given us. 1. Not the problem, but what's beyond it. In response to God's vision for our lives, we would all say, "Yes but what about (fill in the blank)" Don't let the "what about..." dictate what you think is possible! Imagine beyond the immediate obstacle you're facing into what would lie ahead if that problem was solved. This is God's perspective. Go there. 2. Not the limitation, but His power. We're all faced with weakness, inability, or insufficiency in some regard. Ones that our fears would try to make us believe is the reason we cannot fulfill what's in our dreams and our hearts. But friend, it's not up to our power or ability. Our weakness is made perfect in His strength! Does He have power for your weakness? Imagine that! 3. Not the "care", but the "casting". By this I mean, imagine if everything in your life doubled. Finances, people, success at work and at home, property, etc. etc. Question: would it be a problem if the "care" you carry (the worry, fears, what if's) doubled with it? You see, fear holds us back in subtle ways. We end up playing in our imagination the end-result of various scenarios. This has to stop in order to see and think like God thinks. Here's to a week with God's perspective filling our hearts and minds. Let's look at what God can do! Prayer this week: Thursday, 7-8:30pm. A great place to learn prayer, talk about it and DO SOME! This week, find some space to begin to journal the answers to these questions. Look up the verses beside each one. Rest a while with this. Let Him speak. 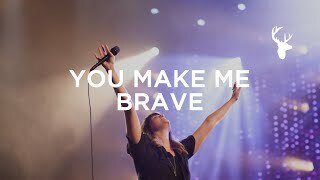 Sound Track for the Week: You Make Me Brave - This song invites the attention of your heart. It's what God's saying to us as a church right now. Let Him speak. Let's have a fantastic week!